Silver Bear ammunition is manufactured at the Barnaul Machine Plant located in Barnaul, Russia. One of the largest manufacturers of Russian ammo, this facility is best known for producing high-quality loads for the Russian military. 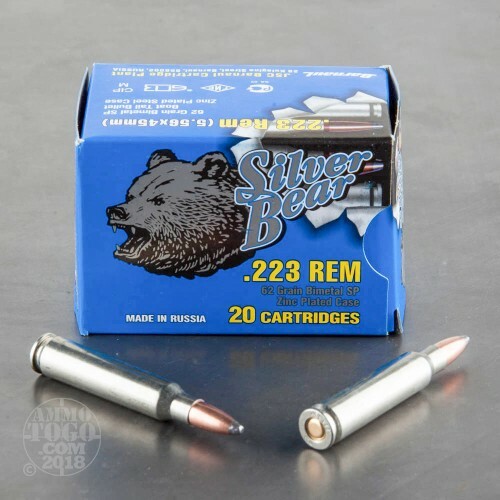 Deriving its name from the highly-polished zinc-plated steel casings, Silver Bear ammo is designed to prevent corrosion and extend shelf-life, making these loads perfect for long-term storage. Offering all the characteristics of nickel-plated brass, it is easy to forget you’re shooting steel cased ammo. 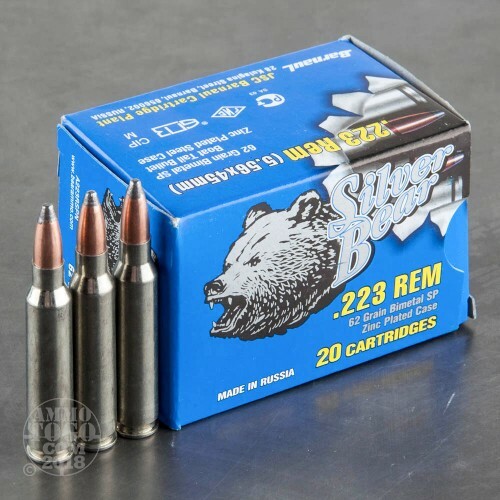 This package contains 500 rounds of Silver Bear .223 Remington ammunition. 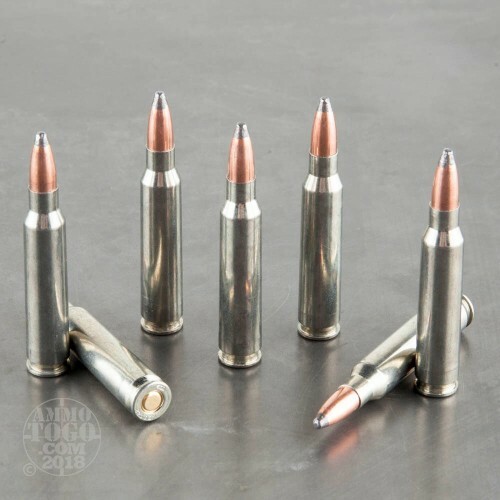 Each of these economical rounds is loaded with a 62 grain soft point projectile. Designed to expand on impact, these soft point rounds are well-suited for self-defense or small game hunting. This ammunition is factory fresh, non-corrosive, and Berdan primed. Each round produces a consistent muzzle velocity of 2906 feet per second. 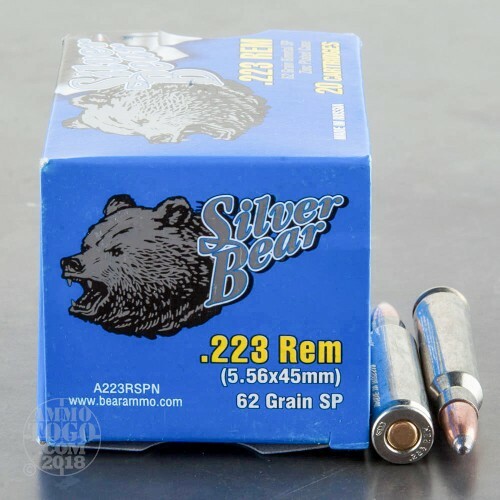 I Have Used 62gr sp Silverbear In My 1-7 twist ar.I Really Shouldn't Write This Comment. Because You Can't Find The Stuff Any were. I Is a Great Bullet. That Is Why Everyone Is Always Sold Out. Shoot great in every AR i've seen eat it. Perfect for plinking or breaking in a rifle. Shot 100 rounds. No bad primers. Expands perfectly. The gun firing the round was new, and not broken in. Did have one casing fail to extract & require tools to remove (otherwise it would have a perfect rating). Definitely would be the only ammo I would use in a bolt action rifle for hunting, though. The round tends to travel upwards upon penetration. IDK about the other people, but I had repeated hangups with this ammunition in my Rock River Arms LAR15. The Soft lead tip kept hanging up on the feed ramps. It didn't happen every time, but enough for me to opt for hollow points the next time I pick some up. Otherwise Silver Bear rocks. It is plenty accurate & shoots clean. I loved the soft point's ability to tear up the targets. Wish it would've functioned better for me though. Well live & learn I guess. I bet it would be perfect in a bolt action rifle. Not the most accurate ammo, but for this price what do you expect? Shoots nice, never had a F.T.E. or broken case like I get with the Remington UMCs...can't beat it for the price. Love this stuff. For the price it beats Wolf and Remington UMC. Great grouping at about 1/4-1/2inch. Get 1000 rnds. you won`t be disappointed. My rock river arms AR-15 eats this stuff like candy. This is all I'll buy from now on for plinking.